Faceted search is becoming a contemporary and de facto search tool for content rich websites, in particular online stores and digital libraries. In addition to results listing, a faceted search UIs provides a result digest containing various "orthogonal sets of categories", each providing independent aspect or facet related to the search result set. 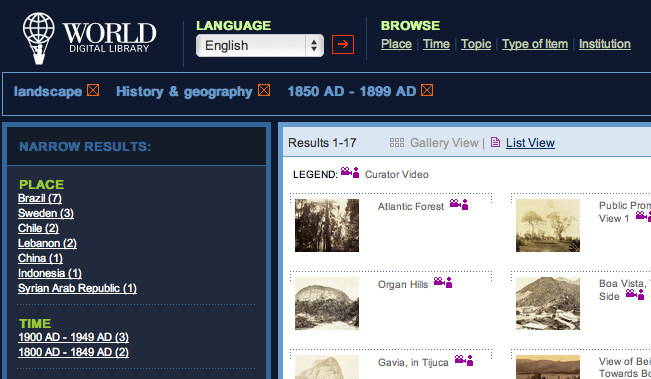 For example, the figure below shows the faceted search interface of the World Digital Library. Users can browse or navigate among these facets which are typically listings of metadata links such as author, topic and year (of publication), all accompanied by the respective number of matching items within the search results. The facet links are essentially advanced search shortcuts. Selecting a link is equivalent to performing a boolean (AND) operation involving the keyword and a field with suggested term (that yields results), e.g. 'landscape' (keyword) AND 'type:book' (facet). Faceted search therefore allows users to perform “post-coordinate boolean operations via a navigational metaphor”. In addition, the facets provide information scaffold appropriate for domain research. Due to the integration of search and navigation (browse) interactions, faceted search is often referred as faceted navigation or faceted browsing. From the perspective of interaction design, the navigational approach and the ways with which the facets are presented (highly visible listings), have the potentials to enhance the affordance of advanced search. Less efforts are required from the users to perform the equivalent and traditionally more convoluted search task: opting for advanced search in UI, selecting search fields and typing in terms. This in turn encourages repetitive and quick use: successive clicking of several facet links. Modern faceted search UIs also provide breadcrumb trails displaying the search context (keyword entered, selected facets); some enable the search context to be repurposed and manipulated, e.g. removable facet, changing the search term while maintaining the facet selection. In combinant, these factors facilitate fast drill down of search results and enhance user experience. Apache Solr is a Java search platform based on the Lucene indexing and search library. It is a stable open source technology, gaining popularity and used by many public and commercial websites. The Guardian uses it for the Open Platform and has good things to say about it - "robust performance, high availability, rapid scalability". The platform provides numerous and powerful features with indexing and search facilities at its core. It is service-oriented with services accessible via HTTP/XML web service APIs. Hence it can underpin resource discovery UIs (clients) built with other programming languages such as Blacklight (Ruby-on-Rails). I have implemented Solr in 2008 for an earlier version of Blacklight, for a digital library which is being enhanced under the UX2 project. The core services were efficient and speedy. It was feasible to use the same Solr instance to provide auto-suggest interaction. AJAX queries invoked by keystrokes were sent to Solr's dedicated (autosuggest) search indexes, retrieving on-the-fly, the title, related author and subject suggestions (see below). I also hacked the engine so that it would index rich documents held in the digital library. The development described in this post (and Part 2) relates to the first three features, i.e. the setup of multiple indexes, importing and indexing multiple data sources: CERN book dataset and Fedora repository objects. Solr provides an admin web UI for inspecting and querying indexes (REST-like URL queries/XML responses). You may want to build or try out some Solr-based web applications such as Blacklight, VuFind, Drupal Solr Module for better visualisation and demonstration of Solr's capability. This post focuses on the setup of Solr for Blacklight. Solr is configured via two essential files: solrconfig.xml and schema.xml. The config files can be found in the example directory - a self-contained Solr instance which can be used as a development stub or starting point. The example directory containing various types of Solr home directory for different purposes, e.g. single core (solr.home/example/solr/) or multicore (solr.home/example/multicore). If you checked the system out via the Subversion code base, you will need to run 'ant example' to compile the source and generate the example instance. The config files are located in 'conf' folders of the Solr home directories (each has a README.txt explaining the directory structure). The solrconfig.xml file contains the typical configuration details such as request and search handlers, specifying what fields to search and which facets to return. For example, the following code snippet defines a 'DisMax' search handler, applying a single search term across several fields of different weighting (boosts). Note: the search fields below (e.g. 'title_t', 'title_display') are defined in the other configuration file, schema.xml. The above example is part of the Blacklight Solr configuration file. We are adapting it for the UX2 project. Hence it will be modified during the course of UX2 development. Further details on configuring Solr: SolrConfigXml wiki, SolrRequestHandler wiki. The schema.xml file describes the building blocks of Solr: the data and field types for querying and indexing. Typically, different field types are defined (string, text, boolean). The field types underpin different fields definition. The defined search fields are applicable in solrconfig.xml, in higher-level contexts (in request handlers) analogous to 'plumbing of parts'. One of the key features of schema.xml is the definition of various text field types and the ways with which text are indexed through a series of text-processing filters. For example, text for sort fields (faceting) are indexed as a single term or token (e.g. "albert einstein"), whereas text for searching are split (tokenised) into individual searchable pieces ("albert", "einstein"). Additional treatments (filtering) are also necessary. For example, Solr provides a StopFilterFactory to filter out uninteresting words (stop words) such as "the", "a", "and". Stemming is also important. It reduces words ("running", "runs", "ran") into their root form ("run"). Other examples of text filtering includes case folding, synonym processing and accented characters normalisation ('protégé' <-> 'protege'). Read more on text tokenizers and filters. UX2 is using the Blacklight schema as a starting point and made a few basic changes so that we can start experimenting with the current version of Solr (4.0). The changes include text fieldtypes definition using charFilter and removing UTF normalisation (which does not seem to work in the Solr 4 just now). Apart from a new 'fulltext' text field exclusively for rich document content (cf. the catch-all text field for both metadata and fulltext content), all fields are currently left unchanged. Starting from Solr 1.3, the concept of Solr cores was introduced, enabling a single Solr instance to run multiple indexes ('cores'). The cores are independent of each others and can be managed individually. Each is a fully-function live index with its own configuration and data. Multiple cores addresses some key requirements: rebuilding and reloading index, testing new configuration, creating new indexes, merging or swapping indexes. All of these can be accomplished 'hot' or on-the-fly' without the need to shut down the server. solr.xml basically specifies the cores and their respective home directories which needed to be created (e.g. mkdir fedora). Each of the core directory must contain a conf subdirectory (see below) with the appropriate config files including the solrconfig.xml and schema.xml as described above. Now for importing some data into the cores! CERN has released the bibliographic book data held in its Library as part of an initiative to open up data for open access. A remit of UX2 explores use scenarios (concentration user experience) enabled by the aggregation of multiple data sources and the existing digital library objects. The main objective is to develop a unified and enhanced resource discovery UI via usable and useful contemporary interaction design patterns such as faceted search and world cloud. The above creates a data import handler named dataimport and refers to a DIH config file, dataimport-cern-books-config.xml which resides in the same directory as solrconfig.xml. The DIH config file informs the handler about the data source (CERN data file) location, what fields within the dataset to read and how they map to the index fields specified in schema.xml. For example, the following maps two MARC XML fields (001, 245a) to the id, and title_display index fields of the cernbookdata core respectively. To initiate the data import, start Solr (with multicore), use the DIH interface of the web admin (e.g. http://localhost:8983/solr/cernbookdata/admin/dataimport.jsp): select the 'dataimport' handler and opt for 'Full Import'. Use the XML Stylesheet Transformation (xslt) functionality of DIH to pre-process the CERN data file, replicating and aggregating MARC fields prior to DIH (one-to-one) mapping. Note: The latest Xalan jar files needs to be in the Java virtual machine's /lib/endorsed directory to prevent a 'no more DTM IDs are available' exception during indexing. So, here it is, the CERN dataset imported into a Solr core and Blacklight. Also check out the UX2 Blacklight prototype. In the next post I shall describe how Fedora digital repository objects are indexed for the fedora core.